With my mother here we are starting new traditions. I need to find out what time the Texans play (who would have ever thought that would matter) next Sunday so we can plan if it is a brunch or dinner get together day. If the Texans play early than I know better than to invite Luke, Ally and family down for brunch-it isn’t going to happen. But maybe if it is a later start time, we can all be together for an early brunch at the small restaurant near our house. Previously, Sundays were pretty much spent at horse shows and if not at horse shows than doing chores with horses. Now, with momma here, it is a good day to pick her up from the nursing home and take her out. A week ago we did the brunch thing and this week I cooked. Lauren and I, alone, have not been big on any kind of Sunday dinner. I remember when we would visit Oklahoma when I was a child and my grandma would make fried chicken and cream gravy. I will never forget it. So, so good! Yesterday, I made a chicken with wine and mushroom thing. Lauren seemed surprised it was good. She remarked, “I didn’t know you could cook”. Guess I have kept that hidden pretty well. It felt pretty good to sit down at the Sunday table (which we never use) with my mom and daughter. We even said grace. It would be nice to have that Sunday tradition with my grandchildren. Maybe they will look back and recall how great granny’s food was, I would never try fried chicken and cream gravy, I could never do justice to that but maybe I still have a few good meals to serve. In another type of tradition, Ryan and Amber’s family got a new Irish Wolfhound. 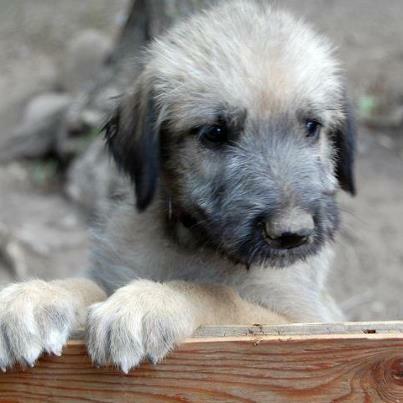 The third Wolfhound that has been in our family. 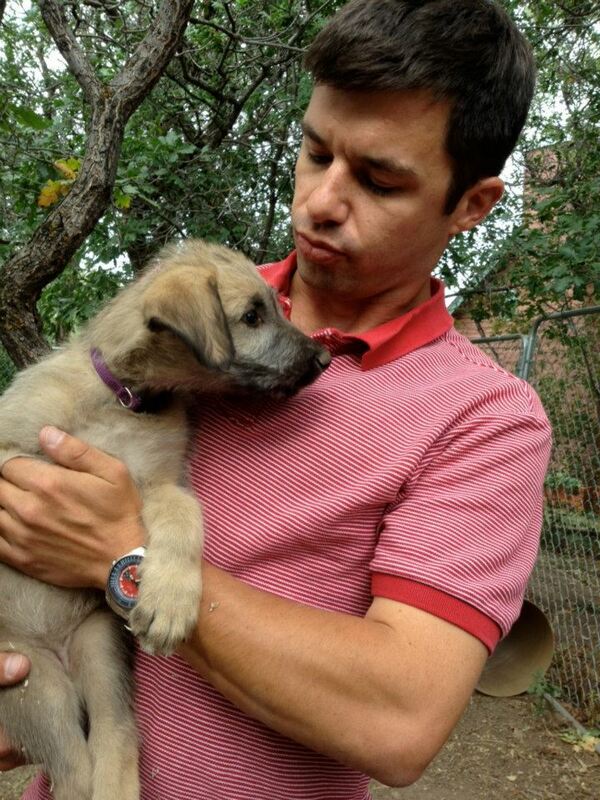 Nellie, who Ryan is calling Nellie Belle came home from Steamboat to Denver this week. This is our first female Wolfhound and at eight weeks and almost as big as their cocker spaniel, Nellie will be a big presence in the family. 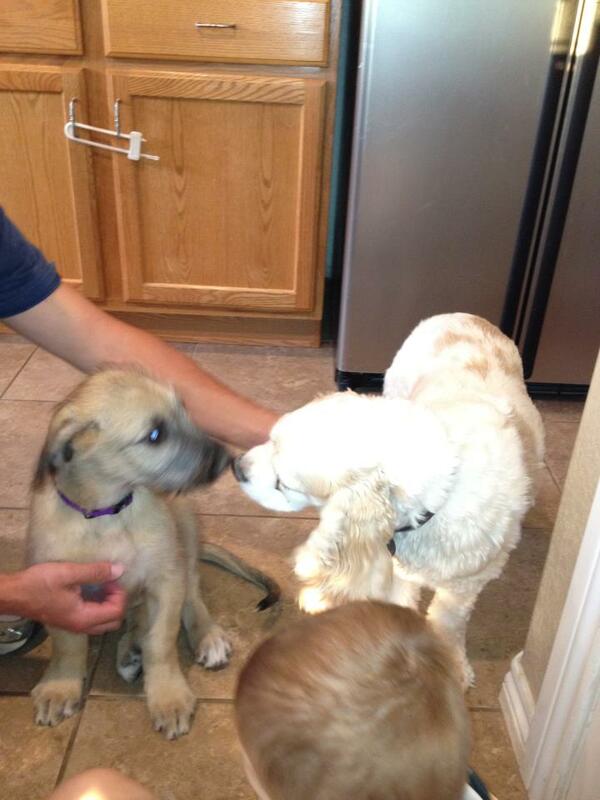 Nellie meeting her new brother, Bailey. She will be the “big” sister soon. I am hoping they will have many, many great years with their new girl. Great traditions come from memories. Lots of great Irish Wolfhound memories in this house. Congratulations to them and to Nellie-she couldn’t have gotten a better home. This entry was posted in Losing my mother-the advancement of Alzheimers by Exechorseluver. Bookmark the permalink. I have tried to resist, but I have no willpower. You and I will probably be the only ones to understand. Your grandma in Oklahoma did know how to do fried chicken and cream gravy, and for what it’s worth she lived south of Interstate 40. Sorry, feel free to delete my comment you want to. Cindy, One of these days I will have to come to Texas and fix you, your mom, and the girls some fried chicken and cream gravy. It is one of my specialities. Have not made it for awhile but it is best cooked in a big cast iron skillet. It is great being in touch with you again!